The Jeep Wrangler is getting some exciting updates for 2018. If you’ve been thinking about getting a Wrangler, now is the time to do it. When you do, you’ll get to enjoy some of these top new features that make it better than ever. While the outside of the 2018 Jeep Wrangler still has the classic good looks of previous generations, you’ll also notice plenty of new features. You’ll still find the fender flares, seven-slot grille, round headlamps, removable doors, and fold-down windshield that are authentic to the Wrangler. However, you’ll also notice stylish new air extractors behind the fender flares that help cool the engine compartment. Additionally, the available LED headlights and taillights offer a striking touch. When you climb inside the new Wrangler, you’ll find an interior that has plenty of major upgrades. The new seat design gives you excellent comfort and support, and the available heated front seats and steering wheel make even the coldest mornings cozier. Plus, with the additional legroom in the back, even your rear seat passengers will have an enjoyable ride. There are other refined touches you can add to your Wrangler, including available leather-trimmed seats and a leather-wrapped dashboard. You’ll find more than just sophisticated touches in the Jeep Wrangler. Every Wrangler comes standard with an infotainment system that includes a 5-inch touch-screen display, voice commands using Bluetooth connectivity, USB port, audio input jack, and eight-speaker audio system. For even more outstanding features, consider upgrading to the available 8.4-inch touch-screen display that comes with navigation using turn-by-turn directions, Apple CarPlay, and Android Auto. There’s even an available 115-volt auxiliary power outlet that lets you easily power mobile devices and electronics when you’re on the road. While the new Jeep Wrangler has plenty of stylish features to make your everyday commute feel more comfortable, it still has its Trail Rated badge, so you can take the Wrangler on any off-road adventure. 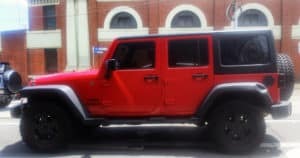 Even though the standard 3.6-liter Pentastar V-6 engine still offers 285 horsepower and 260 pound-feet of torque, it now gets an EPA-estimated 17 mpg in the city and 23 mpg on the highway, making this Wrangler the most efficient yet. You’ll also have better ground clearance, as well as a better approach angle, departure angle, and breakover angle for tackling any terrain. Since Jeep knows how important safety is to you, the 2018 Wrangler also comes with plenty of active and passive safety features. Whether you’re squeezing into a tight parking space or backing out of a cluster of trees, the standard rearview camera gives you another set of eyes behind your vehicle. Plus, with the available blind spot monitoring system and rear cross path detection system, you can feel even more confident when you’re on the road. If you’ve been in the market for a new Jeep Wrangler, now is the time to check out all the great updates offered on the 2018 model.